Two bits of recent pumpkin news: the pumpkin as an artistic platform; and the evolutionary history of pumpkins. Background: from my 10/27 posting “The holidays of our lives”, noting National Pumpkin Day, 10/26, which ushers in the Pumpkin Season, culinarily realized in pumpkin pie as a holiday food for Halloween, Thanksgiving, and Christmas. (And is accompanied by the cultural miasma of pumpkin spice flavoring.) But on to non-culinary matters. I’m still being driven to rebel against all the terribly tasteful pumpkins (esp the white ones) that are loitering around my IG feed & paint the ones I come in to contact with. 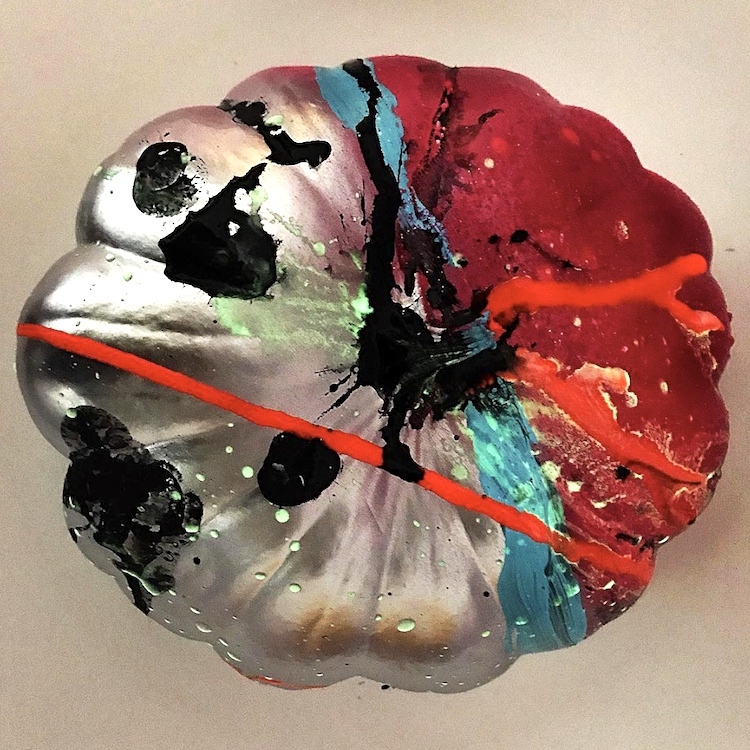 … Chrome, neon pink, neon pink glitter, turquoise stripes, blackest black & lit with a dash of neon orange – the perfect combo on a pumpkin. New research by a team of archaeologists has revealed a curious connection between our traditional Thanksgiving dinner and the taste buds of prehistoric mammoths and mastodons. Today, domestic pumpkins and squash are in a close co-evolutionary agricultural relationship with humans, with big benefits for both species. 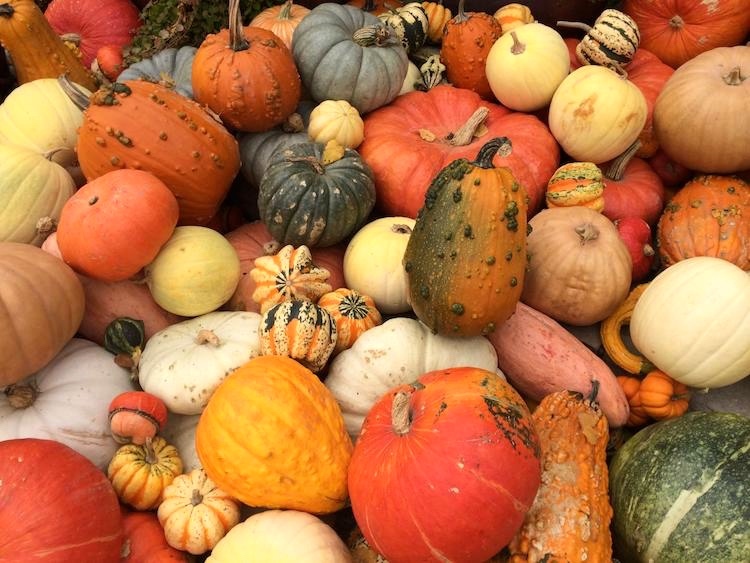 “If you think in terms of the total number of squash plants now growing in the world, squash has been a big beneficiary of domestication,” says archaeologist Bruce Smith of the Smithsonian’s National Museum of Natural History, and co-author of a study just published in the Proceedings of the National Academy of Science. Tens of thousands of years ago in North America squash (Cucurbita spp.) had very different evolutionary partners — mastodons, woolly mammoths and elephants [elephantids] — a relationship that influenced its gourds to be much smaller — baseball-sized — than what we know today and with bitter toxic flesh. … “The plant’s strategy was to allow large herbivores to eat its gourds, and then the seeds would pass through and be deposited some distance away with a little fertilizer in the form of mastodon/mammoth poop to help them to start growing,” Smith says. The strategy worked. Wild squash was once prolific across the North American landscape…. Small mammals with diverse diets tended to have more genes for bitter-taste reception, they found. Larger animals such as elephants have fewer of these genes and therefore have less of an ability to taste bitter plant compounds. In Africa today several bitter species of squash are eaten and dispersed by elephants, the scientists point out. When mastodons and mammoths went extinct in the Americas, wild squash too, saw drastic decline, archaeological evidence shows. “The plants lost their primary means of seed dispersal,” Smith says. At that time, squash switched partners in its evolutionary dance. 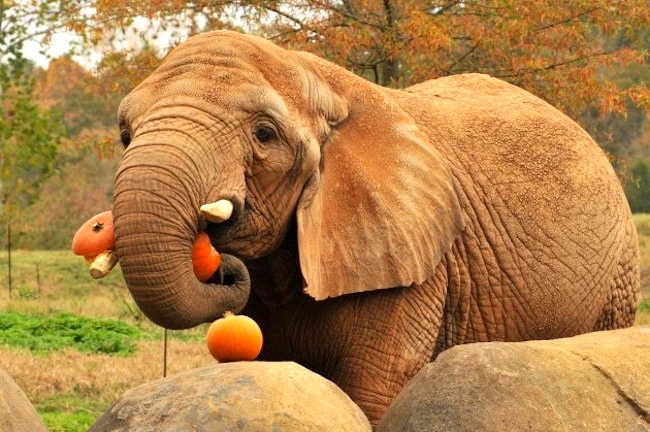 Modern elephants are apparently quite fond of modern pumpkins. This entry was posted on November 3, 2018 at 3:48 pm and is filed under Art, Evolution, Language and animals, Language and food, Language and plants, Mammoths. You can follow any responses to this entry through the RSS 2.0 feed. You can leave a response, or trackback from your own site.